Rectilinear is a type of projection for mapping a portion of the surface of a sphere to a flat image. It is also called the "gnomic", "gnomonic", or "tangent-plane" projection, and can be envisioned by imagining placing a flat piece of paper tangent to a sphere at a single point, and illuminating the surface from the spheres' center. Mathworld's page has an example and describes the mathematics underlying this projection. The is a fundamental projection in panoramic imaging, because most ordinary (non-fisheye) camera lenses produce an image very close to being rectilinear over their entire field of view. Pin-hole cameras, in fact, provide exactly a tangent-plane mapping of the sphere onto their detector planes, and most simple imaging systems (consumer cameras with non-fisheye lenses among them) approximate this quite well. 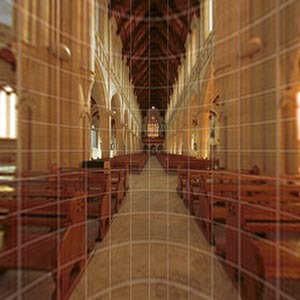 Thus it is the most common source image projection for partial panoramas. The rectilinear projection also has the fundamental property that straight lines in real 3D space are mapped to straight lines in the projected image. This property makes the rectilinear image very useful for printed panoramas which do not cover an excessively large range of longitude or latitude (e.g. <120 degrees). Many Panorama Viewers which show only a portion of a scene at a time do so using the rectilinear projection (regardless of what projection the full sphere source image was in). The Cubic Projection is a special sub-case of the rectilinear projection, in which 90 by 90 degree rectilinear sub-projections are made onto 6 faces of a cube. This page was last edited on 18 November 2007, at 21:21.